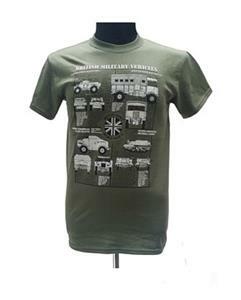 Unique, military themed t-shirt featuring a large image on the front showing blueprint-style front, side and rear views of 4 British WW2 vehicles (Daimler Dingo Scout Car, AEC Matador Gun Tractor, Vickers-Armstrong Universal Carrier, and Morris Commerical Gun Carrier), along with specifications, in black-and-white on an olive green shirt. ò Printed on a cotton, short sleeve T shirt with a crew neck. ò We recommend washing and ironing inside out. This garment is machine washable. ò Garment has a tubular design to prevent twisting.